From the corners of the Pacific Northwest to the hills of New England, the U.S. quickly transforms into a winter wonderland during the winter months. Layers of snow, stunning ice formations, and frozen waterfalls create an entirely different backcountry experience. Waterfalls that cooled us in the summer months become a playground for ice climbers, and trails once hiked by boots will see only snowshoes and skis—giving the earth below a much-needed slumber. However, as adventurers, the winter isn't a time for us to hibernate. Instead, it is a time to explore! Use these five frozen wonderlands to spark your craving for a frosty and beautiful adventure! Inside the Apostle Islands Ice Caves. Kat Dierickx. Wisconsin's Lake Superior is home to 22 islands known as the Apostle Islands. During the winter, once the lake freezes over (and after the ice meet safety standards), the National Park Service allows visitors to explore the frozen lake and the ice caves that form on the other side. 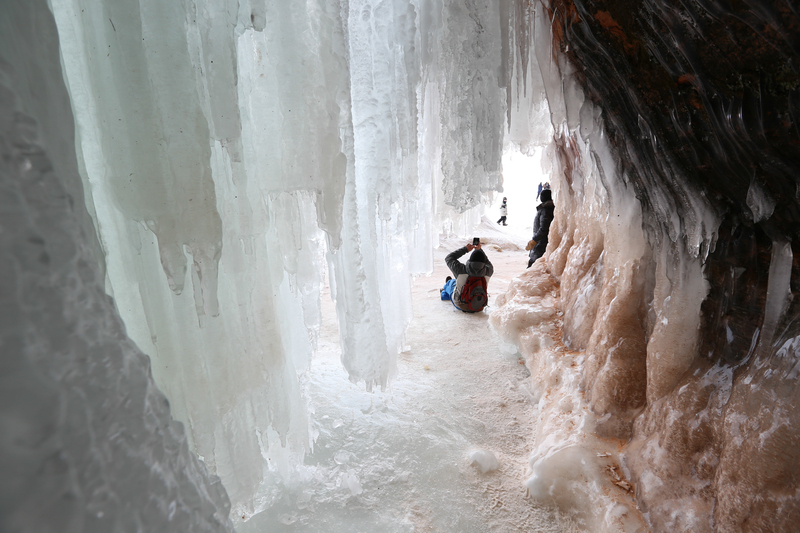 From frozen waterfalls to magnificent icicles and ice formations, the caves are a must when it comes to exploring the wintry days of Wisconsin. In the Adirondacks of New York lies a fantastic spot for winter exploring. You'll need skis or snowshoes for this one, and you'll want to check out our adventure details for which route to take for each. However, regardless of your route, you're sure to fall in love with snow-filled winter wonderland and the incredible ice formations that you'll find along the way to Avalanche Lake. The breathtakingly beautiful mountains that surround you are just icing on the cake. Climbing a line at Ouray Ice Park. Jesse Weber. 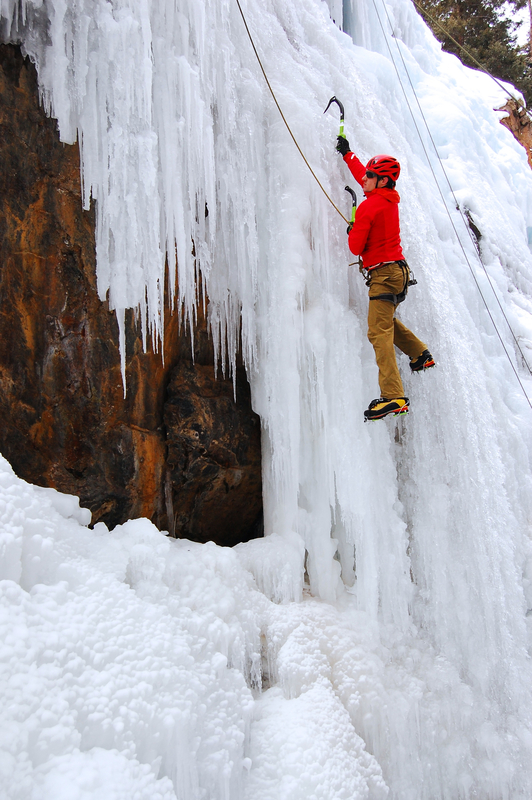 Ouray is known as an ice climber's paradise and can't go unmentioned when it comes to frozen playgrounds. Tucked away in the San Juans of Colorado, it's the perfect location for the newbies and the veterans of this intense winter sport. The park is free, it's just around the corner from Ouray, and you can revive your frozen bones in one of the area's hot springs. What more could you ask for? An overnight stay within the serenity of winter at Crater Lake will give you an experience that you'll spend a lifetime reminiscing. You'll experience the peacefulness of the gentle sound of falling snow to sleeping underneath a sky filled with a billion stars. Awake to sunlight streaming through the trees and to an incredible view of Crater Lake against the contrast of the snow. Yes, it's definitely an adventure to remember. Meigs Falls under a sheet of ice. Kristi Parsons. The southern Appalachian Mountains may not be the first place that you think of when frozen wonderlands come to mind, but they do have their winter charms. 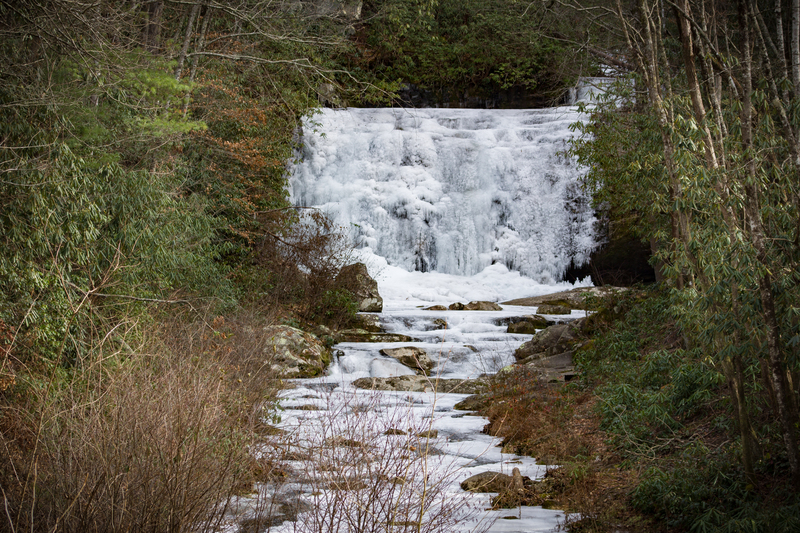 From time to time, frozen waterfalls, like Meigs Falls, appear in the highlands of Roan and Grayson, and if anything the sight of a snow-covered landscape or incredible ice formation is more celebrated in the South. As the temps sit below zero for a few days, local adventurers are filled with anticipation, and the abandoned trails of the Smoky Mountains fill with those seeking rare sights. There are unforgettable memories to be made. The winter adventures don't last as long, and spring moves in quickly. Mark Twain once said, "Only put off until tomorrow what you are willing to die having left undone." Tomorrow has come and gone for the Sandy Glacier Ice Caves of Mount Hood. They collapsed in 2015. Their beauty is buried beneath the snow. I'm certain that many adventurers put them off until next year. Now they'll just have to experience them through photographs and videos. Are you putting off an adventure? Is there somewhere that you dream of?